The offshore islanders he was referring to were the British. He wrote a book of that name in 1972, the year before Britain entered the Common Market (now the EU). The book was a history of Britain’s relationship with the European continent. Great Britain is facing that same disunity in exactly nine days. September 18th is the date of the Scottish referendum, when people residing in Scotland have an opportunity to vote on independence from the United Kingdom. The vote will be legally binding. It’s a countdown to chaos. This all started with “Braveheart,” a movie about William Wallace, a Scot who was executed by the English in the late thirteenth century, over 700 years ago. The fact that the movie has been labeled the “most historically inaccurate movie ever made,” with 87 historical errors, doesn’t alter the fact that it stirred emotions in people of Scottish descent around the world. When the new Labour government led by Tony Blair took over the reins of government in 1997, they gave both Scotland and Wales their own national assemblies, a parliament that was designed to appease the Scottish and Welsh nationalists. The British of all people should know that appeasement never works – all it did was fuel the nationalist fires, particularly in Scotland. The Scottish National Party is led by Alex Salmond, who has been described as the most brilliant politician in Britain. He has seen opinion polls progressively move in his favor – the vote is set to be really close. Only residents of Scotland can vote. Sean Connery, the first James Bond and an ardent supporter of Scottish nationalism, cannot vote because he now resides in the Bahamas. 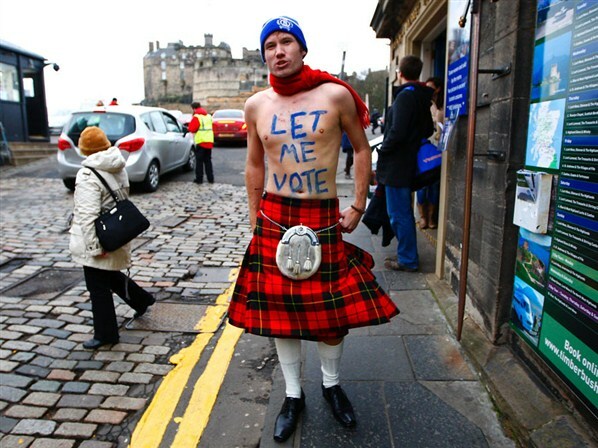 However, 120,000 people from various EU countries can vote because they live in Scotland. This includes thousands of Germans who may see an opportunity here to take Scotland into the eurozone and orient it more toward Germany and the continent. 16-year-olds can also vote. These are more likely to be influenced by the emotion of the movie and have no personal experience of history and the benefits of the Union. Only nine days before the vote, there is still no answer to the big question of money. What currency will Scotland use? A preference has been stated for the British pound but London says this will not be possible as it would mean that two national governments would be trying to control the currency. The logical alternative is the euro. An independent Scotland would have to apply for membership of the EU and all new member countries must adopt the euro. This could mean instant austerity as Scotland depends on England for 10% of its expenditure. A precedent here is the Republic of Ireland, which broke away from the UK over 90 years ago. For some time it had to maintain close financial ties with London but today Ireland is very much a part of the eurozone. Ireland’s national government is increasingly subject to Berlin, which calls the shots. Even road construction signs have “Achtung!” at the top, reflecting closer ties with Europe’s new superpower. “Don’t let me be last Queen of Scotland” ran the banner headline in yesterday’s Daily Mirror, a British national tabloid. The Queen is said to be very concerned about the kingdom breaking up. Following the announcement of the Duchess of Cambridge expecting a second child, Prince William said he was mostly concerned at the international and domestic situations at this time, a clear reference to ISIS and Scotland, two separate issues. The Scottish leader professes to want to retain Queen Elizabeth as Head of State. But this may not last. When southern Ireland broke away from the UK in 1921, the Irish Free State retained the British monarch as its own king. But, in 1949, they severed the tie with the crown and became the Republic of Ireland. In more recent years, it has been able to distance itself further from London, thanks to closer ties with the EU and membership of the euro currency. Independence for Scotland is the logical, though sad, end to the British Empire. In the last 70 years the British have given independence to over 50 countries. It’s as if history is in reverse. Following the full union of Scotland and England in 1707, the British Empire grew in leaps and bounds. In the last seven decades it’s fallen apart even more rapidly. Now Scotland seems set to leave the union with England, with potentially disastrous consequences for both. Even if the vote is to stay in the UK, it will not be long before there will be a demand for another vote. The nationalists won’t stop until they achieve their goal, which is complete and total independence.